Are you considering including Arrupe Jesuit in your estate plans? Join the Pedro Arrupe Society today! The Pedro Arrupe Society recognizes those members of the Arrupe Jesuit community who are ensuring that, for years to come, underserved young men and women will have access to a quality Catholic Jesuit college preparatory education and work study experience. Members of the Pedro Arrupe Society primarily designate their estate gifts to the STAR Endowment Fund. 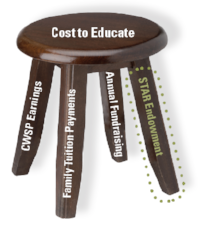 Here, you are building a critical revenue stream to provide tuition assistance for years to come, completing the four-legged stool model of revenue. These funds help close the annual gap in the costs to educate each student that comes through our doors. Our endowment is currently just over $6 million and our goal is to reach $10 million in coming years. Your estate gift will help achieve this goal! I would like to receive more information about planned & estate giving. I have already included AJHS in my estate plans and would like to join the Pedro Arrupe Society.